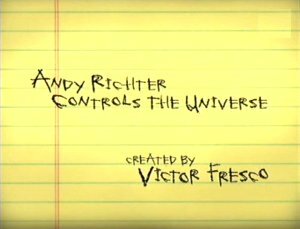 Andy Richter Controls the Universe (known as Anything Can Happen during development) is a sitcom that aired on FOX. Andy Richter is a technical writer for Pickering Industries, a giant corporation in Chicago, but aspires to write novels, short stories, and stories of medium length. He catalogues his daily life, his thoughts, his memories, and occasionally how he imagines things going differently. He's joined by several coworkers: Andy's irritatingly handsome best friend Keith, longtime friend turned boss Jessica, neurotic office-mate Byron, bright eyed secretary Wendy, and occasionally his imaginary friend in the form of long-dead company founder Mr. Pickering.